Bouncing the ball on the paddle appeared in games from the beginning of their existence, and the Arkanoid game is one of varieties. 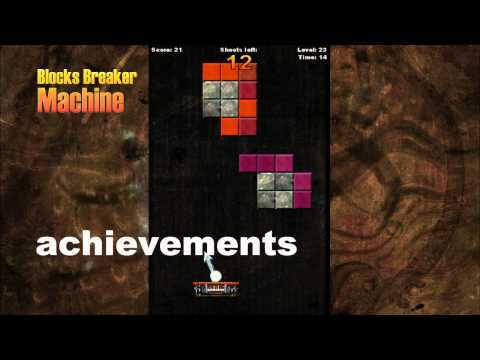 Blocks Breaker Machine is the next variety of Arkanoid, which tries to introduce new elements to this classic genre, at the same time avoiding the introduction of frills, such as gravity. Blue & White mode – in this mode the ball changes its colour from blue to white. In order to destroy the block, the blue ball has to hit the blue block, and the white ball the white block. Time mode – apart from the limited number of lives, the additional difficulty is the passing time. When the time ends, the game ends. Purpose mode – in this mode the proper planning of movement is necessary. After letting the ball go, we cannot move the paddle and we must hope that the properly freed balls will clean the level out of blocks. To carry out this task we have a specific number of balls. Hit mode – in this mode we have a specific number of balls and the limited amount of hits of the ball on the paddle. In order to clear the level we have to pay attention to each hit of the ball on the paddle, as its reckless hit may lead to the end of the game. Journey mode- is a combination of all modes in one fascinating adventure. Additionally, on the levels there are special blocks including various bonuses, which can make our game easier or more difficult. In each mode there are 45 rounds to clear, what gives 270 altogether in the game. After each round the game is summed up and we receive extra points for clearing the level in the quickest time possible. The game can be characterised by nice graphics in high resolution and diversified music.